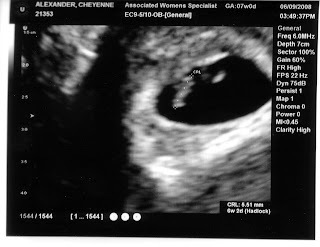 The Alexanders: First Doctor's Appt! OK I know this picture is not good at all, but can you see that seahorse looking smudge kind of to the left side of the black oval? Well, that's Baby Alexander #2!!! It's still very early, so there are not really any recognizable body parts yet, but hopefully next time I go we will be able to see a lot more! The doctor said that the baby and I look good and the important thing is we saw the heartbeat and it's not twins! So YAY! Due date is still set for the end of January. Your prayers are appreciated, and if you want to be specific, no nausea!! Thanks!